The William Morris Gallery in Walthamstow has come forward half a century from the Arts and Crafts movement to tell the story Walthamstow school of art in its glory days in the late ‘fifties and early ‘sixties – one of those conjunctures of the right teachers, the right students, the right place and the right educational environment that made something great. They call the show “Be Magnificent”. On till 10 September. Out of it came some of the most influential creatives of the 1950s and 60s, when class barriers were breaking down in art, fashion, music and film. Among the talent were musician Ian Dury, filmmakers Ken Russell and Peter Greenaway and fashion designers Celia Birtwell, Marion Foale and Sally Tuffin. It was the era of the NDD, the National Diploma in Design introduced into art schools after the Second World War. Until that time you could still hear the last gasp of the Arts and Crafts movement. After came Basic Design, a multi-media training for artists derived from the Bauhaus, industrial design, commercial art and fashion studies. The NDD insisted on “objective drawing” and in most art schools students who drew like Picasso or cartooned were penalised. But some were independent and encouraged innovation. Walthamstow was one of them. The school thrived under Stuart Ray, who became its principal in 1951. He took personal responsibility for selecting staff and he interviewed every student. He believed that talent could not develop unless it was nurtured and hired skilled teachers who were also practicing artists. 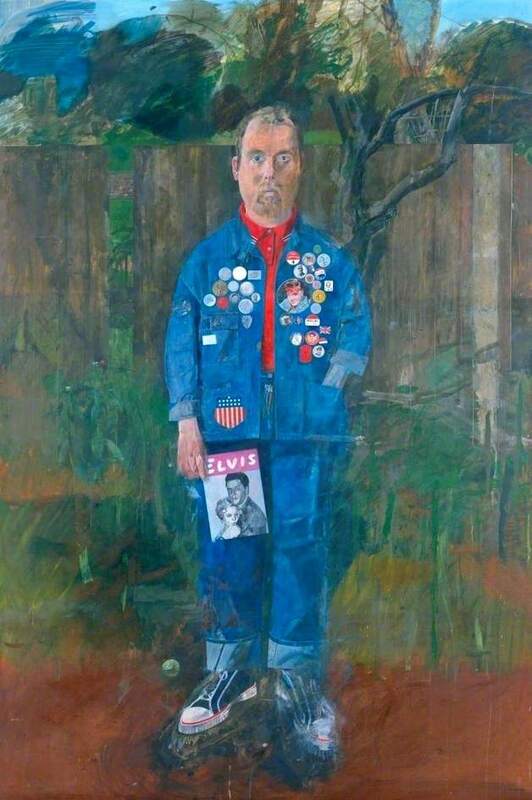 His team included Peter Blake, Derek Boshier, Joe Tilson, Olywn Bowey, Margaret Green, Ken Howard and Fred Cuming. Blake started at Walthamstow in 1961 and was joined by Boshier in 1963. They had come from the Royal College of Art where they pioneered Pop Art. Walthamstow became a Pop Art hub. There was little difference in age between the students and some of their teachers. Peter Blake never arrived before 11, usually with a hangover, and went straight to The Bell, where he usually found his students. Instead of telling them to get back to their classes, he bought them a drink and taught them there. 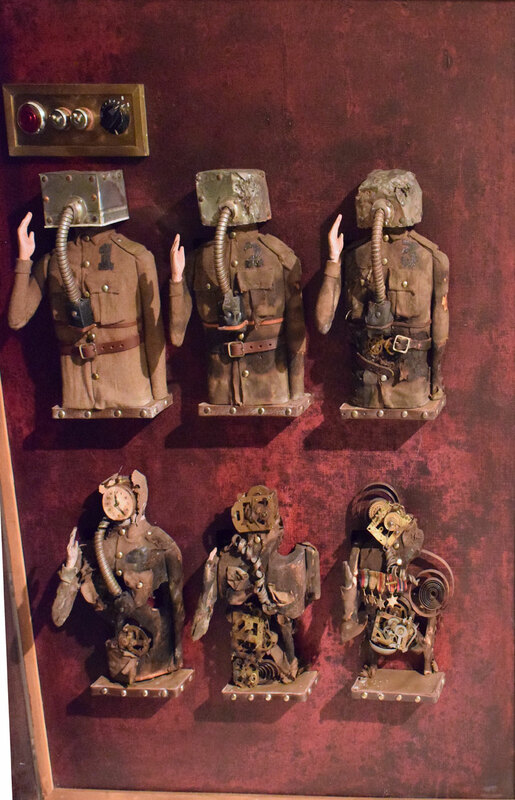 One of the remarkable works to come from Walthamstow is The Invitation Card by Bill Jacklin, which he made in response to his father’s post-traumatic stress disorder from the First World War, displaying mechanical soldiers in various stages of breakdown. He made it at home and it was too big to take to the college, so Blake, Boshier and Tilson gave their critique in his bedroom. 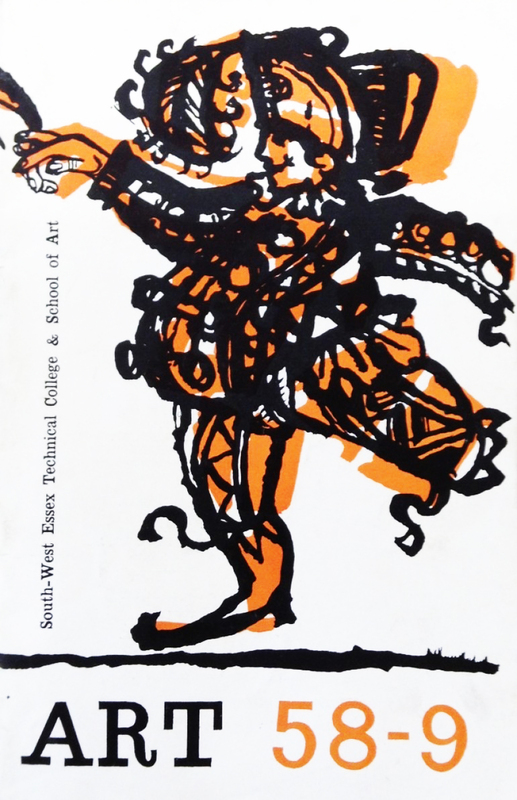 In the early sixties Walthamstow was one of the best schools of art in the country. The Royal College of Art admitted more students from Walthamstow than from anywhere else. 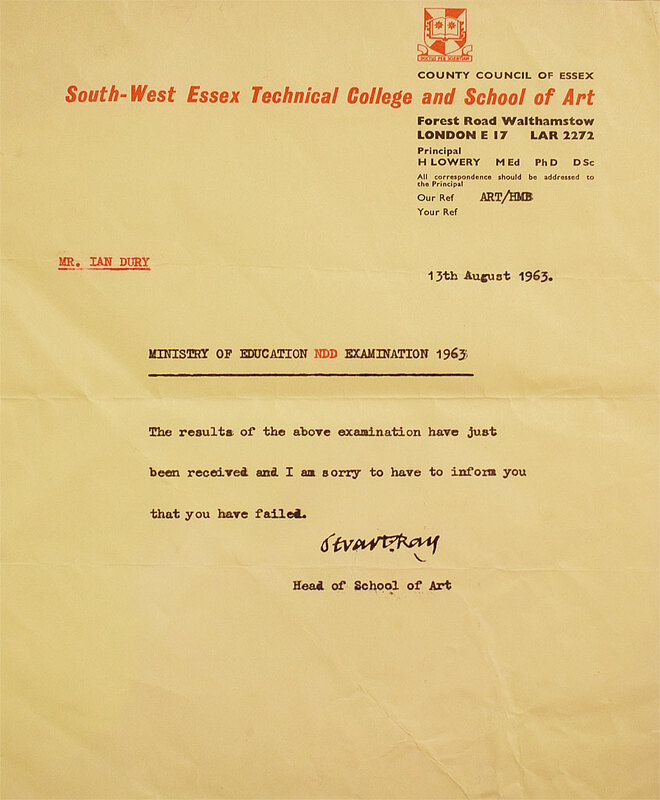 But a perverse outcome of the Coldstream reforms was that accreditation for the new Diploma in Art and Design was witheld from many well-regarded school, including Walthamstow. The new system favoured standardisation and academic content and could not accommodate Walthamstow’s quirky hands-on teaching methods with pub tutorials and bedroom crits. Unable to compete with London art schools offering DipAD courses, Walthamstow’s glory days were over. In the 1970’s, it was merged into North East London Polytechnic (NELP), now the University of East London. I worked in NELP’s publicity department from 1971-72 and knew some of the lecturers in what had become the department of art and design. Stuart Ray had been demoted to deputy head and the stars of the school had left. Ian Dury, by the way, failed his NDD (below).